Tynelle Gumbs met one of her season goals of a 50m Discus Throw and joined the 50-50 throwing club, by also extending her personal best in the Hammer Throw, during a competition in Ada, Ohio, on Saturday. Competing at the Polar Bear Invitational, Gumbs, a Findlay Jr., hit the 50m barrier twice, first 50.70, (166’4”) on her third attempt then 51.43m (168’8¾”) on her fifth throw to seal the victory. 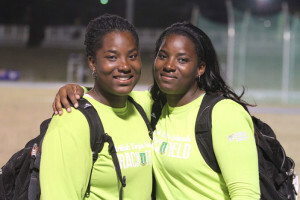 Combined with twin sister Trevia getting a personal best of 47.87m (157’0¾”), which came on her second throw, led to a 1-2 finish in the competition. In the Hammer, she uncorked a third round 58.58m (192’2¼”) throw to shatter the 57.68m (189’2¾”) from earlier this month to complete the double victory. Trevia’s 13.85 (45’5½”) effort, won the Shot Put. Khari Herbert was third in the Central Intercollegiate Athletics Association Conference Championships 400m in 46.80 seconds, after winning his heat in 47.86. The St. Augustine Sr. was fourth in the 200m in 21.76 seconds, after winging his heat in with a personal best time of 21.37 seconds, to help his squad in claiming the conference title. Clemson freshman Lakeisha “Mimi” Warner, placed fifth in her heat and ninth overall in the LSU Alumni Gold 400m Hurdles on Saturday. She was timed in one minute, 00.26 seconds. Central Arizona freshman Tarique Moses, ran 49.41 seconds and finished third in the Mesa Thunderbird Invitational 400m. His 2 minutes 07.77 seconds in the 800m, was the eight best time of the competition. South Plains College sophomore Taylor Hill of the BVI, finished eight in the 100m with a time of 12.21 seconds at the John Jacobs Invitational in Oklahoma. Central Iowa freshman Judine Lacey was third in the 400m Mucso Twilight in Iowa City, IA, with a time of 59.18 seconds. She did not finish the 200m. Elsewhere, competing in the IAAF World Relays in the Bahamas, the BVI quarter of Nelda Huggins, Tahesia Harrigan-Scott, Karene King and Ashley Kelly, were seventh in the 4x200m on Saturday, with time of 1 minute, 35.35 seconds. They advanced to the final, after running 1:34.92. In Sunday’s 4 x 100m Relay, Huggins, Harrigan-Scott, Kelly and King ran 44.78 seconds in the prelims, then botched the handoff between Harrigan-Scott and Kelly, in the B final, and did not finish.